"'In the meantime,' continued Mr. Larkin, 'how would you like to sell some books? 'That's always fun. You'd be surprised at the great quantity of odd people who read books. Some even buy them. I wonder why?'" While, as I discuss below, Amazon remains the prime source for new books at the best prices, the venerable Science-Fiction Book Club is an attractive alternative for those books that it issues in its own editions (almost invariably less costly even than Amazon's prices, albeit for physically different editions), and--most especially--for its frequent omnibus editions of series or related books. Those omnibus editions are often not only the best way but the only way to obtain clean new copies of some classic works. I have an entire small page on the Science-Fiction Book Club, including a link direct to their special-offer "join-up" page. Some of the books listed on this site--those currently available new--can be bought direct through this site from whichever of Amazon's divisions (U.S.A., U.K., Canada, Germany, France, or Japan) carries them (often all do). Before I discuss the mechanics, I had best say a few words about this site and my connection with Amazon. Whenever commercial considerations appear in connection with a web site, that entire site then runs the risk of appearing to exist solely or primarily as a shill to draw visitors into, in this case, buying books to the enrichment of the site owner. Let me dispel some of that smoke. No one--or at least no "one" who is not a gigantic commercial entity running a web site with visitors in the six and seven digits monthly--is making significant money off book referrals. The percentages that referring affiliates get are small, and the number of actual purchases is not usually much to write home about. All in all, any site that manages to make enough in book commissions just to pay its service-provider and domain-name fees is doing very well indeed. From the point of view of the visitor--you--Amazon is as good a place to buy new books from as any other and better than most. The price you get by buying a book through this, or any other Amazon affiliate booksite, is exactly the same price you would get visiting the Amazon site on your own: Amazon pays out its minims to affiliates entirely from its own gross. Amazon require affiliates to present a message from them: this is a link to that message. Amazon offers free shipping on qualifying orders. "Qualifying" orders are those meeting a certain modest minimum amount--which varies from division to division as shown in the table below--of "qualifying" items, which includes virtually all new books. The region within which qualifying orders ship free also of course varies from division to division, but invariably includes at least the domiciling nation. Exact details are on the corresponding Amazon sites, but virtually all new books qualify. Click on a division name in the table below to see their shipping-info "help" page. I have created a separate page to discuss the complexities of international book buying, which is sometimes the only way to obtain a particular book new. Each book--each distinct title--has a page that shows all editions of that title available new at every Amazon division carrying it at all. Here is how such pages look and work. There are one or more preferred editions of this work. when applicable, a note that there are one or more preferred editions of the work. Below that info box will be the informational statements you see above. They are largely self-explanatory, but to amplify one small point: Amazon's by-division free-shipping minimum will show up on the particular page for some one individual edition as sold by that division--you'll see it when you need to know it. If, though, there is even one edition available at even one Amazon division, you will not see that message, but instead will see one of more data boxes--one for each distinct edition of the book available new. Each such box will have the particulars for that edition at all Amazon divisions that carry it, and will look something like these two samples. Note that because both of these are "trade paperback" editions, their information boxes are--as the notes above said they would be--aligned to the left margin of your browser screen. That alignment is meant to be a convenient shorthand way for you to quickly see what editions are of what sort, something especially handy when there are numerous editions available (as with, say, Alice in Wonderland). This is the American preferred edition of these works. This is the British preferred edition of these works. That is all pretty self-explanatory, but I will mention that clicking on any of the prices shown for an edition will bring up a new page with much fuller details about that particular edition as offered by that particular Amazon division. The tabulations above only include editions of this title still available new from at least one Amazon division; there may well be other editions, perhaps many, that are now out of print, and so are not included above. You can do a search on Abebooks for used copies of all editions of this title (which will include any already listed above); the results will be returned sorted as lowest-price-first (lowest book price, not necessarily lowest total shipped cost). Each edition listing on the all-editions page for a given title has, as you saw above, a table listing all divisions carrying that edition. Clicking on any of the division names shown will, as stated above, then bring up a details page for that edition at that division. If the individual-book pages are "moons" circling author-page "planets" on this site, then the particular-editions pages are "moonlets" circling a given book-title "moon". An edition-details page will almost always show the same data the editions listing on the main book page did, but--because the one-edition page's data is exactly up to the moment--it is possible that the price or availability may have changed in the hours (never over 24) since the main page was made. The details-page data are the current data. Perhaps equally useful, each individual-edition page also carries all of whatever editorial and reader reviews Amazon has available for that title (take care to note that those reviews are not necessarily for the particular edition shown--Amazon does not segregate them by edition, and there's no way for me, or anyone, to peel them apart after the fact). The top part of such a page (after the heading identifying it as coming from this site) will look pretty much like this (note that this particular book happens to be an omnibus). This time, the title shown is the one Amazon assigns, which may not be exactly the same--in wording, capitalization, or spelling--as I use here (my versions come from the printed books themselves, while Amazon's come from heaven knows where, and are often somewhat, or a lot, incorrect). More comment appears below this sample. That is all, again, pretty self-explanatory: the book title as Amazon has it (as discussed above); the author's name; the type of binding; the publisher; the price, in the currency of that particular Amazon division; that price translated, using reasonably recent exchange data, to its equivalent in other some currencies, to give you an idea of the cost in units with which you may be more familiar; Amazon's claims (too often exaggerated) as to how quickly they would ship an order out; and a button allowing you to place the book in your Amazon "Shopping Cart" for that Division (if you don't already have such a Cart, Amazon will wlak you through creating one). Note that as with all "Shopping Carts", you have not bought the item till you go to your cart and "proceed to checkout", which is when you really order and pay for the book. There are two other interesting things in that display. First, right under the cover image is an Abebooks link; that Abebooks line is based on data extracted in real time when you clicked up the page, and shows you what used copies of this exact edition can be had for; the price is always in the same currency as the Amazon Division in questions uses. (The Abebooks price is just that--the price--and does not include the seller's shipping charges.) Second, Amazon displays some of what they call "related items". Such "related items" are an Amazon feature, for which they use their records of other customers' buying habits to try to determine what other books you might be interested in if you're interested in the one this page is for. It's harmless, and occasionally interesting or useful. In Viriconium, the young men whistle to one another all night long as they go about their deadly games. If you wake suddenly, you might hear footsteps running, or an urgent sigh. After a minute or two, the whistles move away in the direction of the Tinmarket or the Margarethestrasse. The next day, some lordling is discovered in the gutter with his throat cut. Who can tell fantasy from reality, magic from illusion, hero from villain, man from monster . . . in Viriconium? Published here for the first time in one volume, and in the author's preferred order, are all the Viriconium stories, originally published in four books: The Pastel City, A Storm of Wings, In Viriconium and Viriconium Nights. In Viriconium, the young men whistle to one another all night long as they go about their deadly games. If you wake suddenly, you might hear footsteps running, or an urgent sigh. After a minute or two, the whistles move away in the direction of the Tinmarket or the Margarethestrasse. The next day, some lordling is discovered in the gutter with his throat cut. Who can tell fantasy from reality, magic from illusion, hero from villain, man from monster ...in Viriconium? Published here for the first time in one volume, and in the author's preferred order, are all the Viriconium stories, originally published in four books: The Pastel City, A Storm of Wings, In Viriconium and Viriconium Nights. Then, below the Editorial comments (which may on occasion not exist for a given book) come Reader comments. Those can range in number from none to hundreds; be aware that when the number is high, the page can take a while to finish loading (as it has to fetch multiple pages from Amazon to capture all available reviews). The Reader comments are always presented in order of "usefulness", which is determined by how other readers have voted on the comments. The presentation of a single reader comment will have the number of stars that reader gave the book, a descriptive title or phrase for the comments, and the tally of other-reader votes to date on the comment (shown as "helpful" votes over total votes cast, such as 5/8). What appears below is just a fraction of the actual comment set for the book sample used here. First, I should say that this book - actually, three novels and a number of short stories - is an excellent read. Secondly, it isn't exactly what you might expect from the Amazon blurb - the text about the murderous nightly games in Viriconium. That comes from the start of the first story in the volume, "Viriconium (K)nights". It suggests that these are stories of of no-holds-barred rivalry between picturesque factions of killers - you know, intrigue, fights, twists of fate, betrayal, all seething beneath the surface of the city. Actually, it's not like that, it's much better. At the surface level, the world of Viriconium is apparently our world tens of thousands of years in the future. Industrial civilization has risen and fallen, leaving its name (which nobody can read) in the stars - and a poisoned and depleted world, where people survive as best they can, scavenging from the past and nursing bits of decaying technology. The geography is vague (no hand drawn maps!) and all identifiable landmarks have gone, apart from the names of some (real) places and features (Dunham Massey; Rannoch Moor; Lymm) and (especially) Viriconium street names: it's fun spotting the literary or geographical allusions). The first two novels (`Pastel City' and `Storm of Wings') explore the consequences of this and develop the idea in a number of ways, some subtle, some gross. While haunting in their atmosphere and very inventive, they are fairly conventional. Perhaps significantly, much of the action takes place far from Viriconium. The short stories apparently fit between the novels and take a more personal, close up look at the lives of characters in this extraordinary world. They are much stranger, and focussed mainly on Viriconium, as is the last novel (`In Viriconium') Don't try to work out exactly what order these stories go in because it's just not like that. The same characters appear in what can only, I think, be accounted for as alternate versions of the same worlds. Characters who are heroes in one story show up as decidedly shabby in another. Even the names shift (so, Uroconium rather than Viriconium). And what's going on with the repeated scenes? Events in one book are echoed, in a different context, elsewhere. For example, the encounter with St Elmo Buffin and his experimental telescope in "Storm of Wings" and a similar scene with Emmet Buffo in "In Viriconium" - similar down to the unsatisfactory snack of fish given to the visitors. Or the descriptions of the Mosaic Lane baths in "Lord Cromis and the Lamia" and in "A Young man's Journey...". Then there is the repeated theme of folk ritual - often involving dancers dressed as animals or with animal heads. I'm not sure exactly what is happening here, but for me, the way the various stories intersect, reinforce and contradict one another recalls a mythology, or a body of folk tales, rather than a single narrative. It's as if the whole thing has grown up rather than being written, or the stories have been reconstructed from earlier versions, from underlying texts. At the end, a link emerges between Viriconium and our own time. Its nature is enigmatic, though, and as with much else, we are left to wonder exactly what it means. As other reviewers have pointed out this is a bleak world, a chilly place, an Earth almost wound down. But it is far from depressing. The short stories in particular portray a world of intense cultural creativity - they mostly revolve around dancers, musicians, poets and artists. And the description of the city is captivating and real - convincing not so much because of what is said but because of what isn't. You would only leave out so much - or allow so much contradiction - if you were describing a real place, wouldn't you? It must be true, or it would look more perfect. 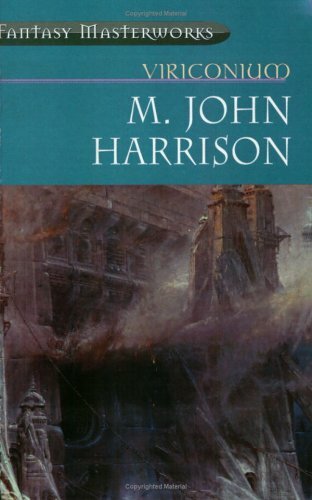 In the first two books of this series, Harrison was attempting to write commercial fantasy somewhat at odds with his own talents and interests, more or less, as someone says, in the Moorcock mode. By the time he came to write In Viriconium and Viriconium Nights he had learned effectively that there was no point in his trying to write commercial fantasy because the fantasy he wrote wasn't commercial. I knew him slightly in Manchester, when he was writing in the basement of Savoy Books, who were essentially his patrons and great enthusiasts, who gave him the time and money to write In Viriconium, which they originally intended to publish but went bankrupt before they could do so. By freeing Harrison from the commercial restraints of the genre, Savoy allowed him to come into his own and produce the second two books in this volume, which in a sense are best read first, because this is invented-world fantasy about as far as you can take it and still have it bear any resemblance to the genre (upon which it comments so successfully). Harrison is not an under-rated writer, he is an under-published writer, and it is wonderful to see his work at last getting the status, respect and admiration it deserves. Jack Connolly. In Viriconium is one of the finest fantasy novels of the last thirty years. Heartbreaking in its realism, vicious in its satire, witty, observant, and stylistically in a class by itself, this is a book that can be reread again and again. The early Viriconium novels read like Moorcock pastiches but with a flair for vivid simile. They display an obvious impatience with the 'Fantasy' genre, but haven't quite found a way to dismantle it. In Viriconium however offered life in one of Calvino's Invisible Cities, a weird amalgam of Prague, late Victorian London, Paris, Yeats's Byzantium, and Venice. Harrison seems steeped in the English decadent writing of the fin-de-siecle, and there are echoes here of Wilde, Beardsley, Baron Corvo, Swinburne, Ernest Dowson and others. What emerges though is a powerfully original and intellectually challenging book that is far beyond the capabilities of most writers in the fantasy genre, let alone their readers, as can be seen from a certain review here. Why MJH isn't better known, I have no idea. He's easily a better stylist than McEwan or Amis. Maybe he's just one of those like Christopher Priest whose books will always be caviare to the general. Buy this book and change your life. Again: It is not always the case that Editorial or Reader descriptions are available. If one is not, the simple message (none available) will appear. I have, though, set things up so that for the Amazon Divisions of Canada, Germany, France, and Japan if no reviews show up, the page then looks elsewhere for information--first to Amazon USA, then (if there is still no result, as may well be the case for books published in Britain) to Amazon UK; if it finds reviews at one of those Divisions, it uses them, but always with a note telling you that the reviews are from a "foreign" Division's records. That is actually just the end of the white-background information box: just as their is some boilerplate identification text above it, so there is some further boilerplate text (about HTML standards) below it--including a link to info and downloads for the best-of-all browser, Firefox)--that ends the total page display. By and large, each by-title page will be short and load quickly (though the cover images may take a while to fully appear), but there are about a dozen exceptions--books with huge numbers of editions whose files will thus be a little slow to load (Alice in Wonderland is the worst case). There is a summary list of all fiction titles listed on this site (I also list a few nonfiction titles--books about science fiction and fantasy or about the English language) on the Particular Books page, but normally you will get to this or that individual-title page by clicking on the title where it appears in context somewhere on this site. And--again--remember to be sure, for your own benefit, that you do not have hidden scumware running as a parasite on your computer.